'Scruples' (Lynda Miller, R. 1989). Seedling #3487B. MDB, 6" (15 cm). Late bloom. 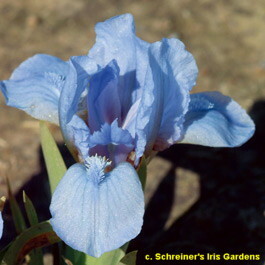 Light blue violet; falls veined slightly deeper, light blue signal; light blue beard; slight musky fragrance. Seedling #784: ('What Not' x 'Wee Sooner') X 'Sapphire Jewel'. Miller's Manor 1993. Honorable Mention 1997; Award of Merit 1999; Caparne-Welch Medal 2002. From AIS Bulletin #289 April 1993 Introducing SCRUPLES (L. Miller) MDB, 6", L. Clear and crisp light blue-violet with slightly deeper veins on the falls. Sdlg. 3487B: (What Not x Wee Sooner) X Sapphire Jewel. $10.00. Miller's Manor Garden.